Despite Gov. Alexander Rogachuk saying, “We will not allow the building of anything on bones of people,” officials are moving ahead with plans to build a luxury apartment building complex at the site. A mass grave of more than 1,000 Jews shot in the head by the Nazis during World War II has been uncovered in Belarus. Credit: Screenshot. 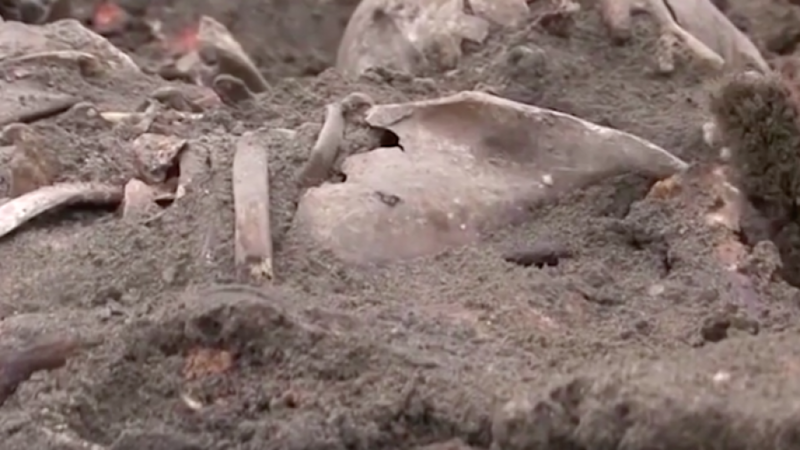 (April 3, 2019 / JNS) A skeleton of a mother cradling her baby was uncovered at a mass grave in the Belarusian city of Brest that was discovered months ago, reported the BBC. The remains of more than 1,000 Jews have been unearthed by Belarusian soldiers. At least 28,000 Jews lived in the Brest ghetto between 1941 and 1942. Some 17,000 people were known to have been shot in October 1942 near the Bronnaya Gora rail station, as thousands more were presumed to have been massacred. Some 66 percent of Belarusian Jews perished in the Holocaust, according to American historian Lucy Dawidowicz in The War Against Jews.